This 2.5" External Enclosure will provide you with easy expansion for storage capacity for Laptops, Notebooks, and Regular Desktops Computers. It is also a very powerful Back Up tool. You can take it with you anywhere, just PLUG & PLAY, transfer information from one computer to another, from a laptop to a desktop, from work to home, from school to home and so on. 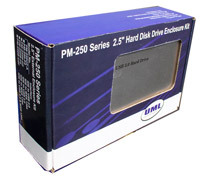 Attach any 2.5" High power 9.5mm Hard Drive to it, like 20GB, 30GB, 60GB, etc. Latest Cypress EZ-USB AT2"! MicroChip. Solid Aluminum case, 1mm thick. Size: 136 (L) x 74(W) x 14(H) mm. Do not need to install drivers in Win2000 and XP or Mac9.X higher. Package includes all objects at pictures shown above.